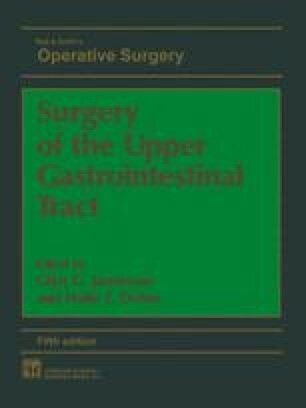 The small intestine is rarely the first choice for interposition after oesophageal resection, but there are instances when it is not practical to use either stomach or colon. These include cases where total gastrectomy and distal oesophagectomy have been performed for lesions at the cardia or where there has been previous distal gastric resection. Similarly, colon may not be available because of previous resection or extensive diverticular disease. Stomach and colon have the advantages of mobility and length over small intestine, but small intestine has a better vascularity than colon and the patient is spared the rigours of bowel preparation.